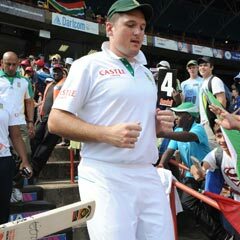 Cape Town – Newlands is a place of plunder for most of the Proteas’ frontline Test batsmen. So who would confidently bet against that trend continuing when the No 1-ranked side entertain weakened, underdog tourists New Zealand in the traditional New Year fixture there from Wednesday? Statistics show just how handsomely South Africa’s premier stroke-players prosper at the picturesque venue, and they also go a long way to explaining why the national side have not lost there since March 2006, when Australia – still closer to their long-time prime then – won by seven wickets. In nine Newlands Tests subsequently, the Proteas have won six times and drawn on three occasions, including twice against the Baggy Greens. Three of the batsmen in their notably settled top five boast significantly better Test averages at the ground than they do overall, the king among them being seemingly ageless Jacques Kallis. The born-and-bred Capetonian and favourite son of Wynberg Boys High School currently sports 12 980 Test runs from 158 appearances at an already sublime 56.92, but that swells much further to 77.70 at Newlands – 2 098 runs in 20 Tests. In order from most recent, these are his last few innings at the ground’s Test crease: 224 v Sri Lanka, 0 and 2 not out v Australia, 161 and 109 not out against India (when most of them were scored in significant pain), 108 and 46 against England, and 102 against Australia. But his captain and friend Graeme Smith also finds Newlands very much to his liking – “Biff” has 8 569 Test runs at 49.53 (105 Tests) and that average swells to 56.78 at the ground, where he has lashed 1 306 runs in 14 Tests. Included in that tally is an unbeaten 101 in the second innings of the famously topsy-turvy Test against Australia last season, as well as a colossal (especially considering it was also second-knock) 183 against England in the New Year Test three years back. Smith’s fellow-opener Alviro Petersen may be a relative rookie to Test action in Cape Town (he has played only two of his 19 Tests here) but he already averages 51.00 at Newlands (his overall figure is 40.79) and will take to the crease against the Black Caps knowing that he registered 109 against Sri Lanka in his last appearance there. The odd ones out, in measuring Newlands Test success against their overall stats, are Hashim Amla and AB de Villiers, but even they are starting to crank up their performances nicely at the ground. Amla has scored 5 323 runs at 50.69 in 65 Tests, and his average dips to just below 40 (39.88) from 10 Tests at Newlands. Last season, though, he had the satisfaction of joining Smith in scoring a ton (112) in the victory charge against the Aussies there. Meanwhile De Villiers (5 894 runs at 49.11 overall) has compiled 660 runs at 38.82 in 12 Newlands Tests. But in recent seasons he has joined the run-scoring “party” very vigorously, his efforts including 160 not out against Sri Lanka last summer and that pulsating 163 against the Aussies in March 2009, when he climbed into hapless debutant leg-spinner Bryce McGain.